Castor's appointment came as a surprise to proponents of a Green New Deal. The move also kicked off a controversy as the six-term congresswoman dismissed calls to bar members who accept money from fossil fuel companies from serving on the committee, arguing it would violate free speech rights. Despite weeks of protests demanding House Democrats focus efforts next year on drafting a Green New Deal, the sort of sweeping economic policy that scientists say matches the scale of the climate crisis, Castor told E&E News the plan was "not going to be our sole focus." "I don't think you can do that under the First Amendment, really," she said. Soon after the remarks were published, Castor walked back the statement in an interview with HuffPost, calling it an "inartful answer." "Maybe that's a discussion we need to have in the caucus," Castor said. It's a stunning upset, essentially returning Democrats to the original plan leaders laid out before the protests began in November. The announcement comes as a loss for Rep.-elect Alexandria Ocasio-Cortez (D-N.Y.). Her meteoric rise and devoted base made it seem as if she were poised to win the burgeoning cadre of leftist Democrats a beachhead in a select committee that, even with limited capacity, would have demonstrated tangible power in Washington. But, if it's defeat, it's bittersweet. The campaign, seemingly quixotic at first, shifted the stagnant climate policy debate not just to the left but, for the first time, in the direction of policies that could make a dent in surging global emissions and curb soaring income inequality. Coupled with back-to-back United Nations and federal reports that showed climate change already rapidly worsening, the effort established a new litmus test for lawmakers, breaking the binary of whether or not a politicians "believes" in the science of human-caused warming. "We don't have time to sit on our hands as our planet burns," Ocasio-Cortez said Thursday in a tweet. "For young people, climate change is bigger than election or re-election. It's life or death." It's unclear whether Ocasio-Cortez will even get a seat on the select committee. Asked if she accepted money from fossil fuel companies, Castor said, "I cannot think of a contribution from an oil company or fossil fuel company, but I cannot say without going back and with a fine-toothed comb that there wasn't something in the past." She said she would consider taking the No Fossil Fuel Money pledge, a vow overseen by a handful of progressive groups including proponents of a Green New Deal. Asked what the decision hinged on, Castor said, "I don't know." "We're at year-end with a possible shutdown and I think the important thing is looking at folks for the committee who are ready to serve," she said. The proposal stormed into mainstream political debate over the past month after protesters from the progressive groups Sunrise Movement and Justice Democrats held sit-ins in Pelosi's office. The demonstrations came in response to what they saw as plans for a tepid response to the climate crisis when the party takes control of the House next month. 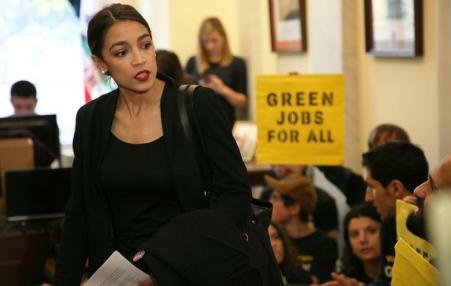 Ocasio-Cortez, a left-wing firebrand with a powerful online following, joined the protests and proposed swapping Pelosi's plan to restore the climate select committee with a plan for a panel devoted to the Green New Deal. Representatives from Sunrise Movement and Justice Democrats confirmed they were not told of the decision until they read about it on E&E News. Castor said she "chatted with Rep.-elect Ocasio-Cortez, but not specifically on this." In a statement, Sunrise Movement said a select committee "that makes a plan for implementing a Green New Deal is an opportunity for Democrats in the House." "Without a mandate to create a plan and a requirement that its members don't take fossil fuel money, we are deeply concerned that this committee will be just another of the many committees we've seen failing our generation our entire lives," Varshini Prakash, the Sunrise Movement's co-founder, said in a statement. "Nancy Pelosi has the power to determine whether or not the Select Committee for a Green New Deal lives or dies," Weber said. "Sunrise Movement's position is and will continue to be that it's not over until she makes it clear that it's over." "I honestly thought the Democratic Party leaders would see this opportunity," said Waleed Shahid, the communications director for Justice Democrats, a left-wing group championing the Green New Deal proposal. "It's infuriating to see a fellow Democrat basically parrot the talking points of the Koch Brothers when it comes to the very common-sense idea that any politician who accepts donations from the fossil-fuel corporations should not be allowed to legislate on climate change." But Castor's appointment won praise from establishment environmental groups. "Rep. Kathy Castor is an outstanding choice to help lead the House's renewed focus on climate change," John Bowman, senior director for federal affairs at the Natural Resources Defense Council, said in a statement. "As a longtime environmental champion, few are better suited to help shine a bright light on the threats Americans face from the climate crisis and advance the solutions we urgently need."